The tenderloin business, like the restaurant business, is no stranger to the forces of change. Places open, places close, chefs and restaurant owners come and go. There are no shortage of stories people tell about their favorite places turning into something different under new management. 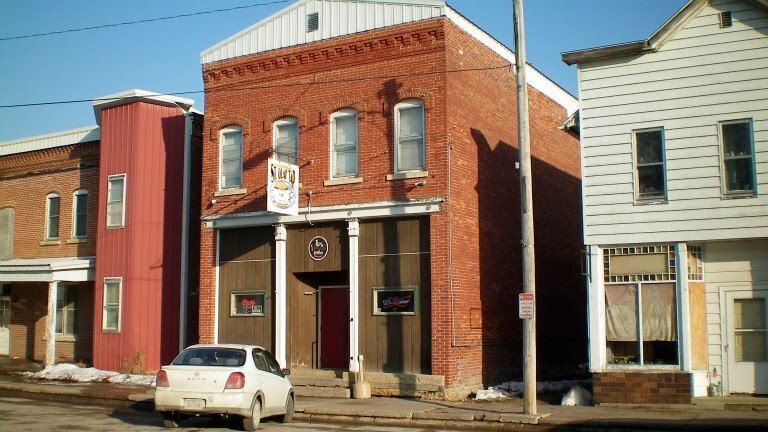 St Olaf Tap has been taken over by a guy who named Lary, spelled with one letter R instead of two. 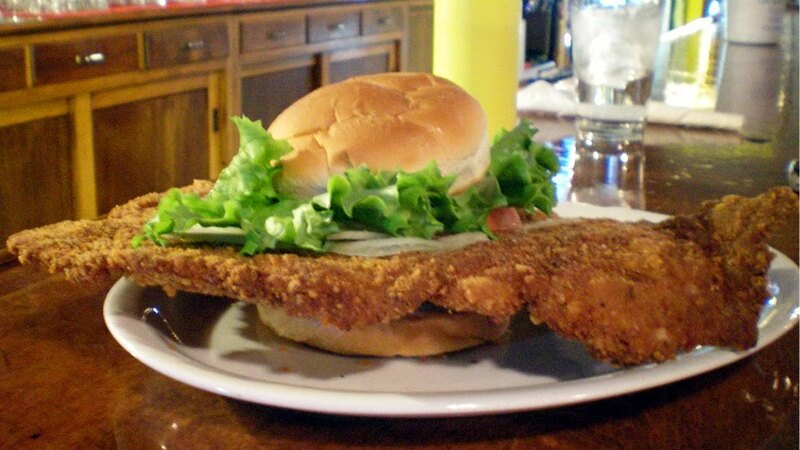 The new owner has changed some things, but there is still a gigantic tenderloin hidden here in the bluff country of Northeast Iowa. 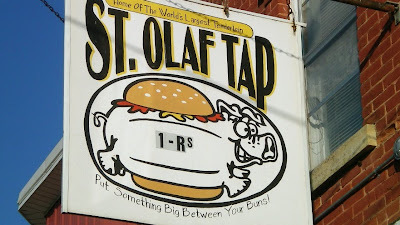 The sign still reads St Olaf Tap: Put Something Big Between Your Buns. This is my second trip to St Olaf, my previous visit was recorded here. Location: 106 S Main St. in St. Olaf, Clayton County, Northeast Iowa. Directions:From Elkader, take Gunder Road or Highway 13 north and turn on County Road B65 to reach St Olaf. The St Olaf Tap the only building that looks open for business on the block. Online at: They have entered the information age with a facebook page here. 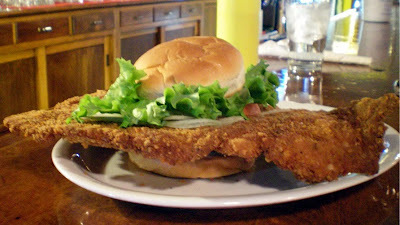 The Tenderloin: The previous incarnation of this sandwich was more like a lightly breaded pork steak that just drooped over the bun. 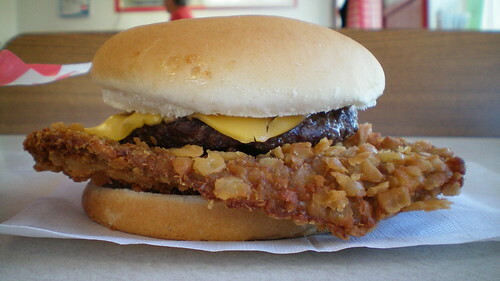 This one has a piece of meat cooked firmer to keep its shape when lifted by the bun. Instead of a light and thin layer of breading, there is a crunchier layer with a little more seasoning. There is a big difference in juiciness, with the new model on the thinner and dryer side. Served with your choice of fixings. Overall 8.2 out of ten, still good. 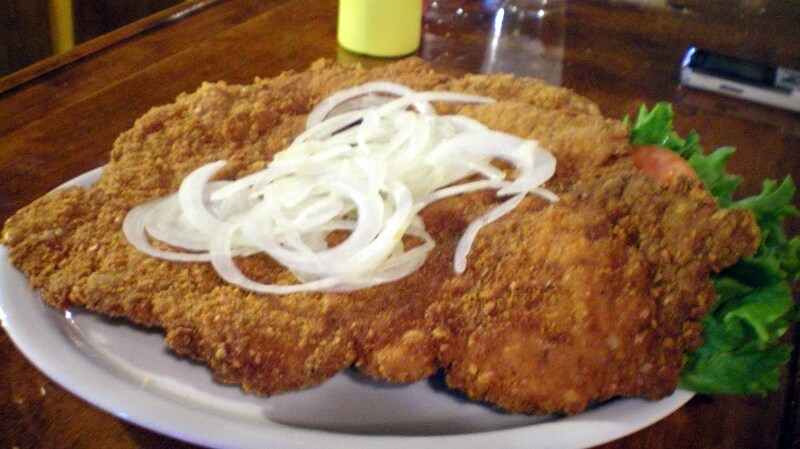 Also on the menu: Lots of typical bar food and fried stuff, burgers, chicken, and Friday Fish Fry. Ambiance: What a difference a coat of paint makes, this place is totally transformed. Gone are the torn up stools, and now you can see the high ceilings of this old building. There are new booths and a bar with a flatscreen television to watch. Service: It was one lady running the bar and waiting tables, with a guy cooking in the back. Final Thoughts: Its always tough to compare something you just ate to a memory of an experience a few years ago. 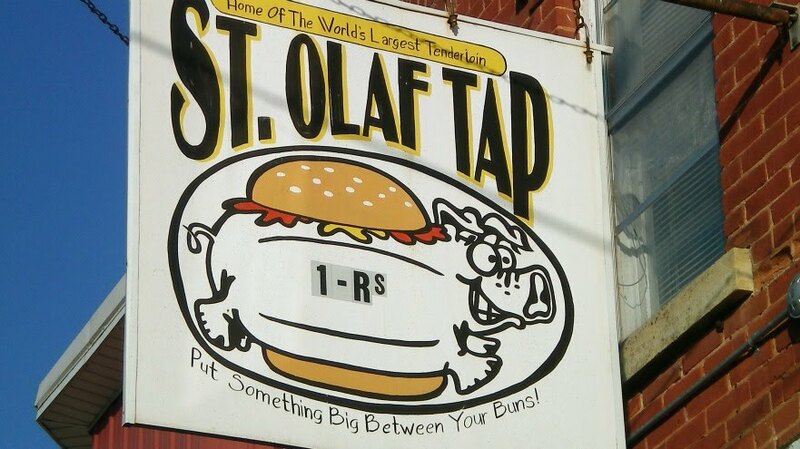 The St Olaf Tap was one of the first real "destination tenderloins" to market itself as the biggest or the best in the world. From what I can tell, they have been doing it for a long time. The previous owner operator was not shy about discussing the frustration of running a restaurant in what he called a "dying town". The new owner has put in the effort and energy to make this a better place, but the tenderloin is just plain different. Good place to eat. 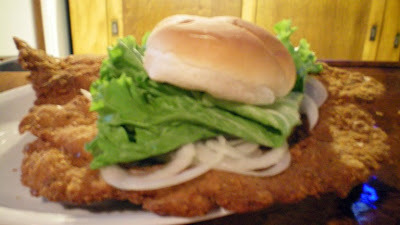 Best tenderloin I have ever had.